Little Berry is a gorgeous 9-10 month old curly haired Patterdale girl who is full of fun and energy! She is currently living in a foster home with other dogs who she is fine with, we would like to rehome her with a friendly male dog and she will need to be kept well socialised with other dogs as she grows up. She has a high prey drive and can’t live with cats! Berry is really loving, and loves a fuss. She is pretty much clean in the house, ok to sleep downstairs at night with the company of another dog, she travels well. She will need plenty more training to keep her mind busy, and of course lots of exercise!! 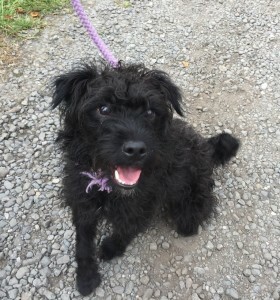 She is a typical Patterdale and will make a fantastic little companion in the right home, we are looking for a breed experienced home for her if possible.